17/06/2018 - Update 3.1.001 contains several important enhancements for all of DynDevice's solutions. 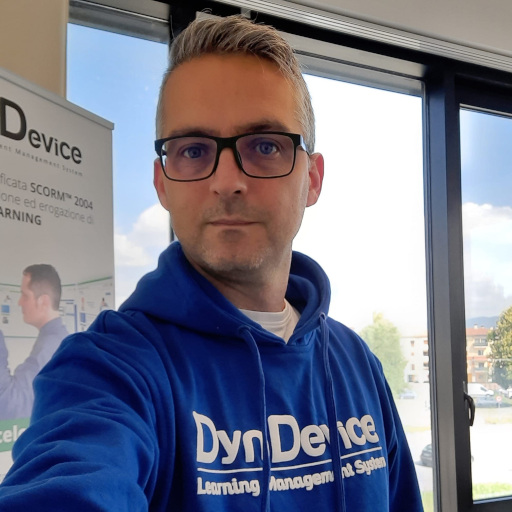 We have just completed the distribution on the whole Mega Italia Media cloud of version 3.1 build 001 of DynDevice (training management system), the complete system equipped with e-Learning platform, SCORM™ editor (LCMS with authoring tools), HR management, web content management and company intranet management. Learner management. In the window for creating or editing learners, the "Name", "Username" and "Group" fields are now mandatory: it is no longer possible to enter or edit a learner if those fields are not compiled. The "--n.d.--" group has been created (where not already existing) on all platforms: when a user is not assigned to any group (e.g. when his group gets deleted), the platform will automatically move him/her to "-- n.d. --". "Learner list" window. We have added columns named "Tax code", "Qualification", "Registration number" and "ERP employee code" - these are hidden by default and can be displayed "on demand". The "Active" column has also been added with default value set on "Yes" which can be changed by users. "Managing deadlines" window. The "Subgroup" column has been added to all included users. "User details" window. From the "User list" -> "Details" window you can now directly access any documents uploaded in the "Other training" section (certificates, attendance or test reports) by clicking on the icons that appear in the "Other training" rows. All enrolments related to a course that no longer exists (e.g. when a course is moved to the recycle bin and then deleted) are now automatically excluded from viewing (and automatically removed). Finally, the [Manage enrolments] button, when it is disabled because the current user does not have the right to access the purple window, will generate the following alert upon clicking: "This function is not available for your account. Please enrol users to courses via "Course list" ->[Enrolled]". Managing ZIP certificates. This function, which can be accessed via "List of courses" -> [ZIP Certificates] has been improved considerably: ZIP files containing user certificates are now generated in a background task while the time elapsed since the start of the operation is displayed in the "Generate ZIP files" line of the window until the operation is completed. This is to avoid failed ZIP file downloads when the file requires a longer time to be generated (browser timeout). Synchronisation of enrolments in the CourStore™. The "Course expiration alert" function which synchronises enrolment data for courses on the CourStore™ has been modified and now also synchronises subgroups and their related information for each learner/enrolment. Compliance with "Active" field. Adjustments have been made so that the "Active" field is now complied with in the windows used to enrol users to a course (in both "1. Training management" and "4. HR management") as well as in the CSV importer (for both enrolment and extension). As a result, it is no longer possible to operate on users with "Active" field set on "No". Importing to "Other training". The function for importing to "Other training" now automatically converts numbers including "," into "." wherever necessary. New platform options. The following new options have been added to "Platform options": "Limit of actives exceeded" in the new "Notifications to administrator" section of "Notifications and use" (formerly "Platform options") and "Import discount matrix" (new "Installation from CourStore™" option in "LCMS/HRMS options"). Other options have been consequently moved/reorganised and the guide has been updated accordingly. Notification to administrators. The alert for exceeding the limit of active users, which used to be sent daily, is now dependent on the new "Limit of actives exceeded" option described above. • we have eliminated a bug which was causing the "Timeline" and "Price management" windows to open up before the end of the installation process. Furthermore, we have improved the displaying of section/categories in the initial CourStore™ screen by solving a problem that was causing the same "Category" to be displayed in multiple "Sections". Finally, the installation process now only imports the price related to the first step of the set discount matrix (with a limit of 10.000) when the option "Import discount matrix" is set on "No". • The checkbox "Schedule notification newsletter in an hour" has been added. If selected, it enables the creation of a " Newsletter" notification for course time extension, with pre-filtering of users involved in the extension, and schedule the operation for an hour after its confirmation. The delay is to enable possible manual editing via the Newsletter module of Solution 5. e-Commerce and website (which as of today is available free of charge for all e-Learning platforms, limited to the functions related to the alert and promotion of e-Learning courses). Course publication. Newsletters sent after the publication of a course in the CourStore™ will no longer display apostrophes (') with an unwanted slash (\'). Modifying a course "Section". It is now possible to modify each course's "Section" from the window "Course Management" -> "E-Learning courses" -> "List of courses" -> [Edit]. In addition, for already-published courses, it is now possible to also view the "Section" field (in read-only mode) in the window "LCMS" -> "List of courses" -> [Edit]. Viewing organisational charts. The value "-- All --" has been added to the drop-down menu for the selection of "Group" in the "Organisational chart" window to go back to viewing all entries after filtering by "Group". It is now also possible to open the "List of learners" window of solution "1. Training management" filtered by the group being viewed in "Organisational chart". This list, displayed with the options related to solution "4. HR management", is equipped with text-based search. List of medical visits. The "List of medical visits" window now also shows the "Tax code", "Date of birth" and "Date of hiring" colums. Ciphering the "Exit document" file on the server. It is now possible to cipher the "Exit document" which is associated to all medical visit outcomes via "Public key" as specified in "Platform options" ("LCMS/HERMS options" tab) or at user level. Therefore, to access the deciphered documents, employees will have to pre-upload their "Private key" with every access (they will be the sole possessors of the private key). Likewise, DynDevice adminsitrators will have to upload their private key at platform level. Management of keys. The [Generate key] button has been added next to the "Public key" field in the "New/edit learner" window. When clicked, DynDevice will generate a private key which will be sent to the user by dedicated notification, and a public key which will be sent to the administrator who carried out the operation (to manually associate the key to the user in the control panel. Introducing management of "Doctors". Functions to enter, edit and delete "Doctors" have been made available as well as the option to associate them to groups/companies and a log of all such actions. Therefore, in the medical visits window it is possible to also associate each visit to a "Doctor" (in addition to a "Medical Centre". Medical visit importer. The importer has been modified to support the "Outcome" and "Doctor" fields. Medical visit exporter. The exporter has been updated with the addition of the "Doctor" field. Blended courses for specific roles. When selecting mandatory courses for specific roles, it is now possible to also select blended courses (classroom/mixed) as mandatory and/or alternative to another course; the window for "Displaying GAPs" (which has also been visually enhanced) and the CSV exporter have also been modified so as to also consider blended courses. "Subscription" module. A new option has been added to use the module in conjunction with module "Discount coupons" of the "E-Commerce" suite. This will make it easier to create campaigns, offers and promotions for your subscribers. We have also added the "Contract" field to "Management of parameters". This is sent as a PDF attachment to the order confirmation email. SSO functionality. It is now possible to specify metadata by URL and not directly via "static" HTML code. This will enable DynDevice to automatically update the identity provider's metadata when it is frequently changed. System menu. The menu of solution "6. Company intranet management" is now correctly generated, based on the options that are actually available according to the user's DynDevice contract. "Company discussions (Progress)" module. The drop-down fields "Author", "Section" and "Category" in the window for entering or editing a "Discussion" have been enlarged.